Debra Burdick, LCSW, BCN, also known as ‘The Brain Lady’, is a Licensed Clinical Social Worker and a board certified neurofeedback practitioner. Debra is an international speaker and author of the best-selling books, Mindfulness Skills Workbook for Clinicians and Clients: 111 Tools, Techniques, Activities & Worksheets (PESI, 2013), Mindfulness Skills for Kids & Teens: A Workbook for Clinicians & Clients with 154 Tools, Techniques, Activities and Worksheets (PESI, 2014), ADHD: Non-Medication Treatments and Skills for Children and Teens (PESI, 2015) and Mindfulness Skills for Kids: Card Deck and 3 Card Games (PESI, 2017). She has taught mindfulness skills to her clients for over 25 years. She recently retired from her private practice, and previously worked at the Child Guidance Clinic, Family Services, Child and Family Agency, and Lawrence and Memorial Hospital. 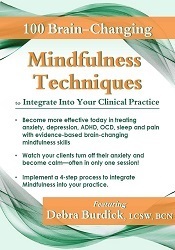 Debra incorporates mindfulness skills in all areas of her practice. She initially became interested in mindfulness to deal with a chronic illness (now thankfully healed). She found it so helpful in her own life that she started teaching her clients the skills she was using. She went on to develop clinical material on mindfulness skills and created a four-step process for working with clients using mindfulness that she perfected in her private practice and in an intensive outpatient program. Her clients have shown her that mindfulness skills improve the rate and quality of treatment outcomes. Debra has presented numerous presentations, workshops, and teleseminars. She is often interviewed on Internet radio and telesummits and her work has been featured in The Day newspaper, Self-Improvement Magazine, and “Parenting Powers” television show. Financial: Debra Burdick maintains a private practice. She is an author for Vervante publishers and receives royalties. She receives a speaking honorarium from PESI, Inc.
Nonfinancial: Debra Burdick contributes to SelfGrowth.com and receives no compensation.